Like many celebrities who have managed to create lasting careers, Wil Wheaton has learned to diversify. The actor was thrust into the spotlight at age 14, when he co-starred in Rob Reiner’s coming-of-age film Stand By Me. His installation into the geek firmament came after being cast as Wesley Crusher in Star Trek: The Next Generation. Wheaton went on to become an author, blogger, podcaster, voice actor, Twitter addict, and overall nerd culture champion. 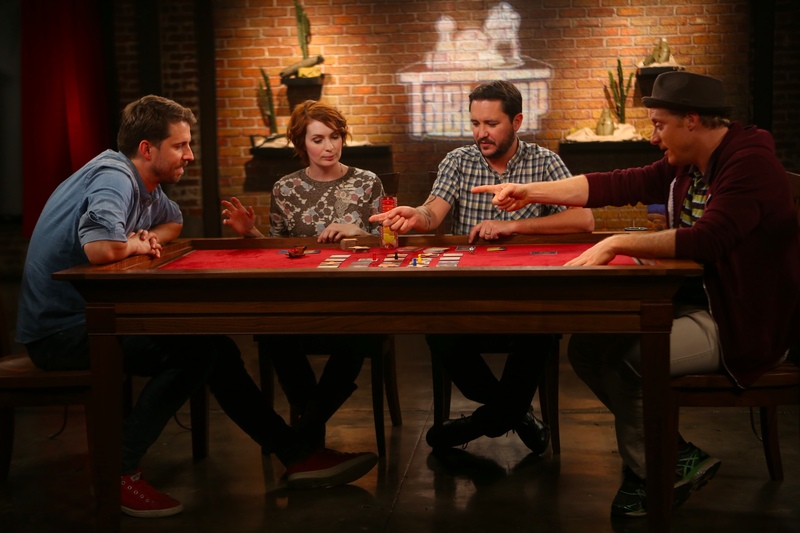 People are watching Wheaton’s show: Season 2 of TableTop pulled in about 8 million views on YouTube, with an average of about half a million views per episode. Funded by a crazy-successful $1.4 million Indiegogo campaign, Season 3 launched this November. Between now and August 13, 2015, episodes will feature guests such as actor Jason Ritter, video game developer and entrepreneur Richard Garriott, and video game voice artist Jennifer Hale. Ethan Gilsdorf: It’s great to finally connect with you. Our paths in the nerd universe have come close to meeting. I’m the author of Fantasy Freaks and Gaming Geeks. A copy of my book got handed to you at Pax in Seattle, I think back in 2009. Wil Wheaton: Oh my gosh. Yes! Of course. I know that book. Wheaton: You’re on my bookshelf. You’re right next to Of Dice and Men . Gilsdorf: That’s cool. Thank you. In my book, I talk about my Dungeons & Dragons background. I started playing in the 1970s and the 1980s. After a long, 25 year break, I’m back to playing D&D again. Now the new edition is out, and the 40th anniversary this year is obviously a milestone. Wheaton: Have you played 5th edition yet? Gilsdorf: I have a little. I have friend with a 12 year old son and he was eager to introduce D&D to him. So I played a little. I think they did a great job. I like the packaging and the production especially, but I haven’t had a change to dive deep into the rules yet. I tend to play rules light with my regular group, you know? What do you think of 5th edition? Wheaton: I absolutely love it. I think that they’ve taken the best of every edition that they’ve ever released and put it into this one, and they’ve managed to get rid of all the stuff that I’ve not liked from the previous editions. It’s really fantastic. I really like it a lot. Gilsdorf: When did you first get into gaming, whether RPGs or board gaming? How far back in your life does gaming go? 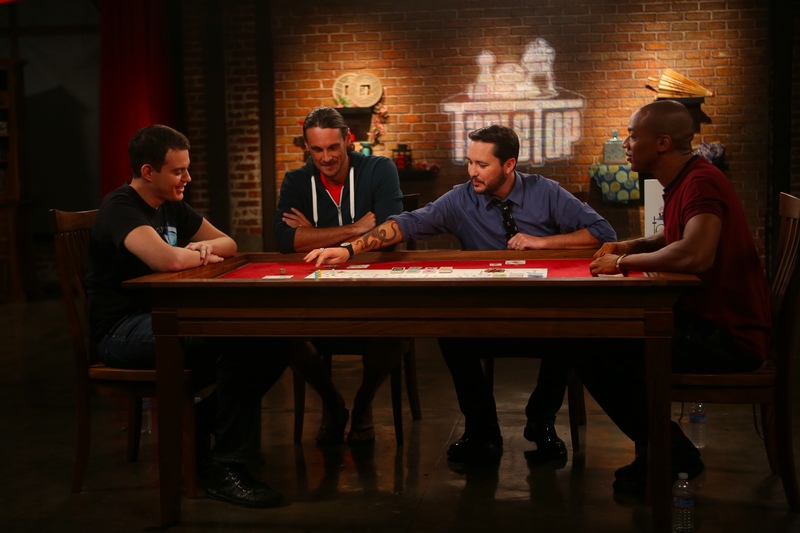 Wheaton: I cannot recall a time in my life when I didn’t play board games. It is very much a tradition in my family. As long as I can remember, we would spend New Year’s Eve playing The Mad Magazine game as sort of a tradition in my family. And one of my babysitters when I was very young always brought Payday. Gilsdorf: Oh yeah! I remember that one. That was great! Wheaton: Yeah, and a game called The Ungame. The Game of Life. But [my introduction to RPGs came] when I was about 10 or so, when my great aunt gave me the red box set of Dungeons & Dragons, which is how a lot of my generation was introduced to role playing games. That sort of alerted me to the existence of these non-traditional games that existed. I fell in love with Dungeons & Dragons, and the storytelling of it, and the weird dice, and the fact that it didn’t use a traditional board. It felt like I was a part of something special and almost kind of like a secret club because a lot of people didn’t know what it was, and didn’t understand it. Then as I got older, when I was around 14, I discovered what we considered to be sort of modern tabletop games. It predates the Euro game wave that sort of hit in the early nineties, but around 1987, my friends introduced me to games like Car Wars and Awful Green Things from Outer Space, and role playing systems like GURPS, and games like Warhammer 40,000. And that was when I really became a capital G Gamer. Gilsdorf: For many people, when you say “board game,” they think of Monopoly, Battleship, Scrabble. There are those who use the more current term “tabletop games” and those people know about Settlers of Catan, Cards Against Humanity, and Munchkin. There are some people who play both kinds of game. When you tell people, “Hey, I play board games,” are they confused which kind you’re talking about? Gilsdorf: Is there a divide there? Do these two groups not talk to each other? Wheaton: I don’t think that that divide is as wide as it once was. There’s certainly still I would say a very thin line between what are considered maybe twentieth century and twenty-first century tabletop games. But if you walk into a Barnes & Noble, they now have a section of tabletop games that is as big as the section of tabletop games at any of the big box retailers. And if you walk into Toys ‘R Us, you will see, on the shelves with Cootie, and Monopoly, and Ants in the Pants, you’ll see Settlers of Catan and Munchkin and Carcassonne and Ticket to Ride. I think that divide isn’t really there anymore, because people are just playing games. There’s a massive group of gamers who are coming to tabletop games. They’re not being introduced with Risk or Sorry or Aggravation. They’re being introduced to tabletop gaming with Ticket to Ride, or Settlers of Catan or Magic the Gathering or Pandemic. They’re coming into it now because just everybody’s playing. Gilsdorf: Five or ten years ago, hardly anyone would say, “Hey me and my buddies are going to play a game tonight,” as an adult, not as a 12 year old or a 10 year old, but as an adult. Now it does seem like it’s a legitimate way to spend a night, not just playing cards or poker or Texas Hold ‘Em, but Settlers of Catan. There’s really been a shift. Wheaton: I would have to agree with that, but I will add that my friends and I, we self-identify as tabletop gamers predating the current tabletop game movement. We’ve been doing that forever. That’s been very normal for me, going all the way back to 10 years old and on, getting together for an evening of Dungeons & Dragons, or a day spent playing a big box game. Back in the old days it would have been Axis & Allies, and today it’s going to be something maybe like Quips or something like that. But that’s a thing that’s existed for us for a very long time. And I would agree that it’s becoming more normalized and more mainstream, but there are a lot of us who have been doing that for a really long time. I personally think that it’s really wonderful that it is becoming kind of a mainstream hobby, to get together and spend a day or evening playing games – and not just with friends and family, but also by going to a game shop, or one of the gaming cafes that seem to be popping up all over the place, and playing with strangers. My friend and producer, Boyan [Radakovich], he coined the phrase “Tabletop games are powered by friendship.” And I think that that is something that you see everywhere you go where people are playing games. Gilsdorf: Do you think that the Internet is helping to mainstream board games? Some might think, “Oh, the Internet is the downfall of board games,” in the same way that “video games are the downfall of tabletop role-playing games.” But it does strike me that that because of the Internet, people are communicating with each other. They connect with each other. Gaming doesn’t have to be a niche hobby. What are some of your thoughts on how board gaming culture got to be so big? That’s a big question, sorry. Wheaton: It’s a big question that. I’m trying to think of the most efficient way to answer that. You’re kind of mentioning a lot of things that overlap and support each other. To the best of my knowledge, a lot of people who play video games also play tabletop games, and vice versa. I know, just speaking for myself, I prefer tabletop games because I like to be with the people who I’m playing with. I enjoy that. At this moment in time, the world of video games has become so toxic and miserable—and I’m confident that’s a temporary phenomenon, because we video gamers have endured worse than what we’re enduring right now. Well, maybe that’s not true. We’ve endured things that are as much of a threat to our identity as gamers as we are right now. But with video gaming being so toxic at the moment, that atmosphere seems to come around over and over again in video gaming. It just doesn’t exist in tabletop gaming. And I think a lot of that has to do with the reality that when we play tabletop games, we’re sitting down with people, and we’re making an effort to play with people, whether they’re friends or strangers. And there’s real-life consequences for your behavior at a table that I think don’t exist when you’re playing online. I think people tend to forget there’s a human being on the other side of that screen. You can’t forget that there’s a human being on the other side of the game board. Gilsdorf: Certainly with Gamergate and other kinds of harassment that happens online, you can’t imagine that happening in a public place or even in a board café. Wheaton: It wouldn’t exist in a public place. That stuff is enabled by technological conditions that allow cowards and bullies to take actions that are essentially consequence-free. And in tabletop gaming, we just don’t see that. Within the tabletop gaming community, there’s games for everyone, from the person who wants to play the extremely technical strategy game where you spend an entire weekend seeing what would happen if a Roman legion led by Napoleon were to encounter the 1946 post-World War Two Russian army, in North Africa. You know? There’s a game like that. Or there’s games like Warhammer Fantasy Battle where someone can spread out a hundred square feet of armies and play like that. And that goes all the way to the other end of someone sitting down to play a couple hours of Stone Age, or two people, like my wife and I, sitting down to play Blokus or Splendor. Because there’s something for everyone, I think people can self-select. One of the things that I’ve never seen in tabletop gaming is this juvenile notion that the existence of a game that I don’t like, or the existence of a gamer who’s different than me, threatens my very existence and the very existence of my hobby. That’s pretty prevalent in video games at the moment, and it’s really not prevalent in tabletop gaming. And I don’t want this to turn into the battle of tabletop games versus video games, but just because at this moment in time it’s something we’re all really thinking about. I think it’s culturally relevant. Gilsdorf: Do you get a sense of how big the audience is for TableTop, who watches it, and how influential the show has become? Wheaton: If you just look at the number of views on YouTube, our audience is global and in the millions. And one of the things that is most surprising to me is that we are viewed extensively by families. I’ve heard from people who have reached out to me. It’s gotta be in the thousands now. The new episode of TableTop comes out, they watch it with their family, and then parents and kids get together after watching TableTop and play a tabletop game. And we see that there’s people who watch TableTop the day it is released, and then there is a huge spike the Saturday after it’s been released. And this lines up with stories that I’ve heard from people, that their friends come over and they sit down and they watch the episode, and then they spend the rest of the day playing board games. Gilsdorf: Do you think it’s impacting sales? Your show goes on, and the next day, does Amazon get huge orders for whatever game you happen to showcase that week? Wheaton: I actually know that that is the case because I have talked with distributors who send these games out to retailers, and I’ve talked with publishers. One publisher told me that, when we played their game on TableTop, that it added $1.4 million to their sales for the year. I think that’s what she told me. Virtually every game we play sells out, almost within the month that the show has been released. And this is actually something that we didn’t expect that to happen when we started the show. So for the second and third seasons, we actually coordinate. Once a game is chosen, we contact the publishers and ask them, “Will you keep this game in print? Are you able to meet the demand that TableTop drives for games?” And almost always they say “Yes.” But if a publisher’s going to not be able to keep the game in stock, we’re less likely to play it. Because people really want to play the games that we play. And I want people to get so excited that there’s just more and more gamers in the world. Gilsdorf: Nothing more frustrating than getting excited about a game, then finding out the thing’s on backorder for six months. Wheaton: It’s one of the reasons that for this season, and just because we’re crowd-funded this year I was able to do this, I published the list of games and the people who played them during production. People who really want to be early adopters, or people who have been thinking about a game but maybe haven’t gotten it, will have an opportunity months in advance to get a game before the TableTop effect hits that game. Gilsdorf: You must be pretty pleased by the response to the Indiegogo campaign. Was that surprising to you? Wheaton: I was really confident that we would be able to fund at least the $500,000 that we needed to do a partial season. I was very surprised at how fast that happened. And then I really wanted to hit our $1 million goal so we could do this RPG show next season, because I want to do for role playing games what we did for tabletop gaming. I really wanted that to happen. I was not confident that it would. I was just delighted. The only hint was, “Okay, stop giving us money. We have what we need.” Then people just. Kept. Supporting us. And what that meant was, we were able to invest so much more into the show, and make the show more than we expected to. I was able to give my crew a raise. Everybody who works on the production, I was able to give everybody raises, which really made me happy because we’re not doing this to get rich. It’s a passion project, and we try to squeeze a buck and half out of every dollar that we spend in the budget. It was really kind of exciting and wonderful for me to be able to do that because of the generosity and the support and the enthusiasm of people who like our show. Gilsdorf: This show on RPGs, will that be another season ofTableTop, or will be a totally differently branded show? Wheaton: It’s a completely different spin-off show where we’re going to play a role-playing campaign that’s going to last for a full season. It’s going to be the same players, same characters, going on an epic journey to tell a pretty epic story that will unfold over the course of an entire season. What I’m hoping for, if we do this right, is we will produce a show that has characters and story arcs that an audience can get invested in. Instead of those characters and story arcs being powered by a writers room, like you would see in a show like True Detective or something, it’s going to be powered by the players and the game master and the adventure that we’re writing. So I’m really, really excited for that, and if it works, that show has the potential to go on indefinitely. Gilsdorf: Does that show have a name yet? Or is it still unnamed? Wheaton: At the moment, we call it “the TableTop RPG show.” I don’t know what it will end up being called. Gilsdorf: I know you’ve done those celebrity games at PAX, with you and the same group coming back every year to play. It sounds like, at least within the gamer community, that there’s definitely an audience for that. Wheaton: Yeah. I think it’s going to be really fun. Well, I know it’s going to be really fun. I believe that the audience is going to like it because they’re going to get something very different from this than they get from what I used to do at PAX. Those were effectively one-shots with persisting characters. And what we’re doing with the RPG show is a full campaign with persisting characters. So what we’re going to be doing is more of a season of a television series than, sort of like movies with sequels. Gilsdorf: Will you be using the new D&D system for your RPG show, or is it going to be something of your own design? Wheaton: We haven’t announced anything about what system we’ll be using. So that’s still under wraps. Gilsdorf: I know you need to get back to editing TableTop. It’s been a pleasure and honor speaking with you. Thanks for your time. Wheaton: Thanks a lot. Take care.